The Karachay-Cherkess Republic (Russian: Карача́ево-Черке́сская Респу́блика, Karachayevo-Cherkesskaya Respublika; Karachay-Balkar: Къарачай-Черкес Республика, Qaraçay-Çerkes Respublika; Kabardian: Къэрэшей-Шэрджэс Республикэ, Ķêrêšei-Šêrdžês Respublikê), Nogai: Карашай-Шеркеш Республикасы, Qaraşay-Şerkeş Respublikası; also called Karachay-Cherkessia (Karachay-Circassia) (Карача́ево-Черке́сия, Karachayevo-Cherkesiya) and the Karachay-Circassian Republic, is a republic of Russia located in the North Caucasus area of southern European Russia. 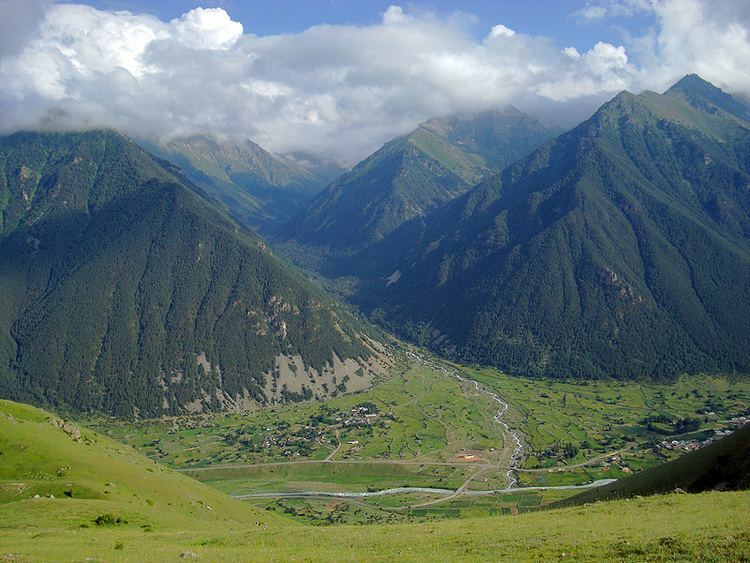 Karachay-Cherkessia is a landlocked republic, bordered by Krasnodar Krai to the west and northwest, Stavropol Krai to the northeast, Abkhazia to the west, Kabardino-Balkaria to the southeast and Samegrelo-Zemo Svaneti to the south. It covers mostly mountainous terrain. The republic has several distinct ethnic groups, and the government recognizes five official languages. The population in 2010 was just under half a million people. The republic is located at the slopes of northwestern Caucasus and borders with Krasnodar Krai in the west and northwest, the Kabardino-Balkar Republic in the southeast, Georgia (including Abkhazia) in the south and west, and with Stavropol Krai in the northeast. It stretches for 140 kilometers (87 mi) from north to south and for 170 kilometers (110 mi) from east to west. Mountains cover 80% of the republic's territory; Mount Elbrus, which at 5,642 meters (18,510 ft) is the highest peak in Caucasus, is located on the republic's border with Kabardino-Balkaria. The republic is rich in water resources. A total of 172 rivers flow through its territory, with the largest one being the Kuban, Bolshoy Zelenchuk, Maly Zelenchuk, Urup, and Laba. There are about 130 mountain lakes of glacial origin and an abundance of mineral springs. Climate is moderate, with short winters and long, warm, humid summers. The average January temperature is −3.2 °C (26.2 °F), and the average July temperature is +20.6 °C (69.1 °F). Average annual precipitation varies from 550 millimeters (22 in) in the plains to 2,500 millimeters (98 in) in the mountains. Natural resources include gold, coal, clays, and more. The Karachay-Cherkess Autonomous Oblast was created 12 January 1922, in the early years of the Soviet Union. It was split into Karachay Autonomous Oblast and Cherkess National Okrug on 26 April 1926. The Cherkess National District was elevated to an autonomous oblast status on 30 April 1928. In 1943, Karachay Autonomous Oblast was abolished, the Karachay people were accused of collaboration with the Nazis and subsequently deported to the Kazakh and Uzbek republics. Most of the Karchay territory was split between Stavropol Krai and the Georgian SSR. 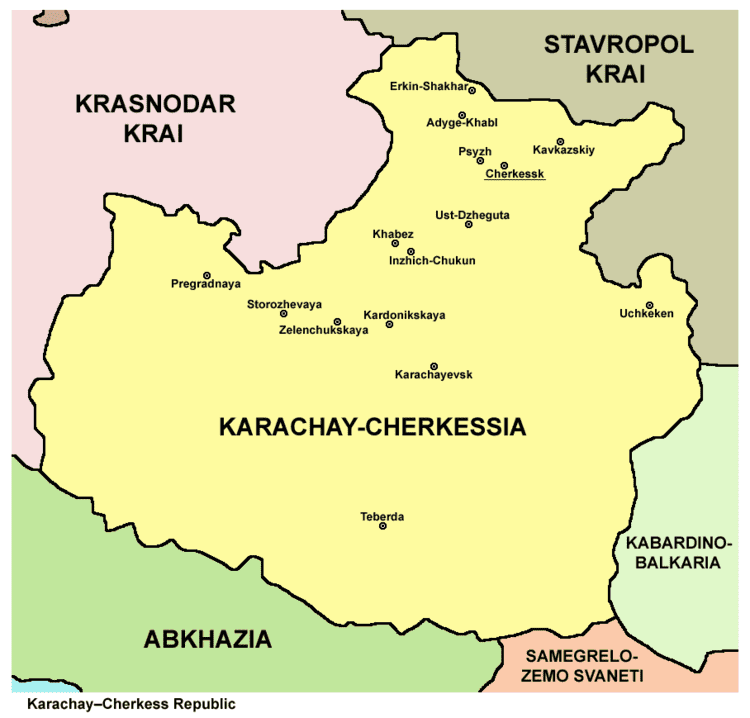 The remaining territory populated by the Cherkessians was known as Cherkess Autonomous Oblast until 9 January 1957 when it was re-established into Karachay-Cherkess Autonomous Oblast in its former borders due to the rehabilitation of the Karachay. After demonstrations in December 1991, the Supreme Soviet of Karachay-Cherkessia adopted an appeal for the recognition of the individual republics. Also in December 1991, the words "Autonomous Soviet Socialist" were dropped from the official name of Karachay-Cherkessia. In January 1992, Russian President Boris Yeltsin was prepared to accept the division of Karachay-Cherkessia and introduced draft laws to the Supreme Soviet of Russia for the reconstitution of the Karachai Autonomous Oblast and Cherkess Autonomous Oblast within the Russian Federation. A commission was established Supreme Education Council three autonomous regions - Karachai, Cherkess and Batalpashinsk. On March 28, 1992, a referendum was held in which, according to official results, the majority of the population of Karachay-Cherkessia voted against splitting the republic and, on December 9, 1992, the republic was recognized as the Karachay-Cherkess Republic. Population: 477,859 (2010 Census); 439,470 (2002 Census); 417,560 (1989 Census). 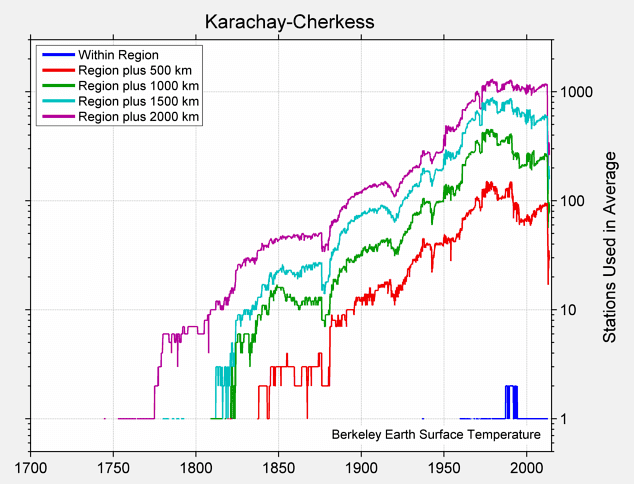 According to the 2010 Census, Karachays make up 41% of the republic's population, followed by Russians (32%), and Cherkes and Abazins together make up 20%. According to a 2012 survey 48% of the population of Karachay-Cherkessia adheres to Islam, 13.6% to the Russian Orthodox Church, 12% to the Karachay and Circassian native faith, 2% are unaffiliated generic Christians, 1% are unchurched Orthodox Christian believers or members of non-Russian Orthodox churches. In addition, 12% of the population declares to be "spiritual but not religious", 7% is atheist and 4.4% follows other religions or did not answer to the question. The head of the government in Karachay-Cherkessia is the Head (until June 28, 2012 the official title was "President"). Until February 2011, the President was Boris Safarovich Ebzeyev, a former judge of the Constitutional Court of Russian Federation. Rashid Temrezov is currently the Head of the republic. Ethnic tension is a considerable problem in the republic. In May 1999 Karachay-Cherkessia conducted its first ever free regional presidential election. When Vladimir Semyonov, a Karachay, won the election over Stanislav Derev, a Circassian, there were protests by supporters of Derev, with widespread allegations of fraud. A court ruling later upheld the election result, prompting thousands of Derev's supporters to march in protest, many advocating partition of the republic. Although activity by separatists in the region pales in comparison with Chechnya and Dagestan, militant groups exist in Karachay-Cherkessia. A car-bomb that killed two people in March 2001 was blamed on Chechen separatists. Muslim separatist groups have formed and dozens of their members have been killed by the Russian authorities. In September 2007, the FSB killed ethnic Abazin Rustam Ionov ("Abu-Bakar"), head of the Karachaevo Jamaat (assembly), along with his wife. The republic is the home of what was the largest telescope of the world from 1975 until 1993 (the BTA-6), a very large radio telescope (600 meters in diameter, RATAN-600), and the Special Astrophysical Observatory of the Russian Academy of Science dedicated to the study of astronomy. 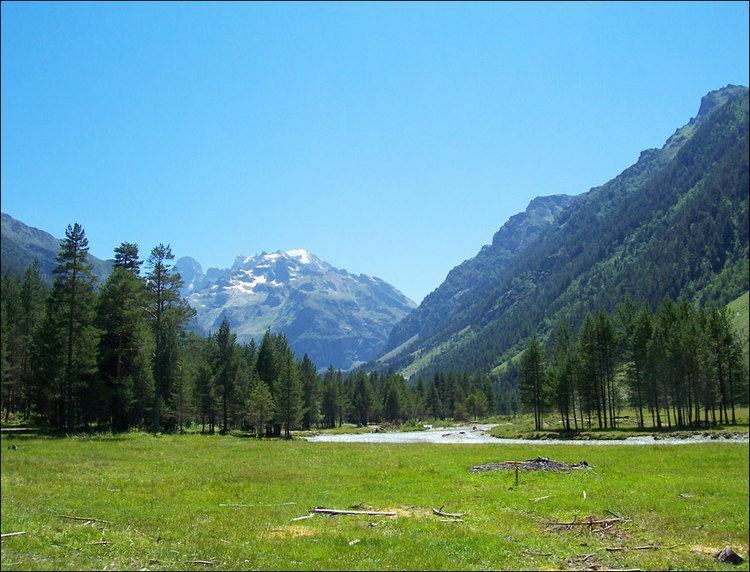 These facilities are located on the bank of the Zelenchuk River, between the villages of Zelenchukskaya and Arkhyz.